What Does It Take to Become a Real Contender in Archery? For those that have never attempted to shoot a bow and arrow, many really don’t understand or know what it takes to do this. Nor do they really have a true appreciation for this sport until they learn more about what it takes to effectively execute a bow for a specific purpose. The purpose relates to the different disciplines that this sport possesses. As with any athlete dedicated to their sport, they must have a real passion for it. This is especially true if they want to compete or if they aspire to become a professional. Archery is no exception. This is a well-recognized sport as is aptly seen in its role at the Olympics. For those that are participating in the sport of archery on a serious level then they must be ready to commit to what it is going to take to be a good competitor. It is not just a matter of devoting an hour or two each day to the shooting of some arrows. It takes real dedication to approach the practice of this sport in a systematic sort of way. It means taking one’s time to perfect every step that is required to successfully fire the arrow where it meets the specified goal. Chances are, those that are keen on competing in archery at a professional level will utilize resources like a coach. It isn’t a matter of just choosing a well recognized and experienced coach. It also involves being able to listen to the instructions and then execute them. It may mean practising the coaching instructions in a repetitive manner until the coach is satisfied. For the archer in training, this means developing listening and learning skills. 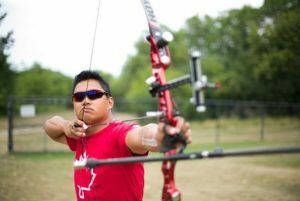 These are just some of the main factors that must be considered for the archer that wants to go beyond the simple enjoyment of the sport and take it to the competitive level.